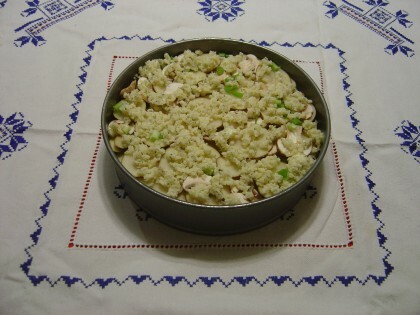 As a vegetarian, I’m definitely never going to work my way through all the recipes in Julia Child’s groundbreaking Mastering the Art of French Cooking ala Julie & Julia, but on August 15, 2012, I joined many online friends in making one of her recipes for her 100th birthday. 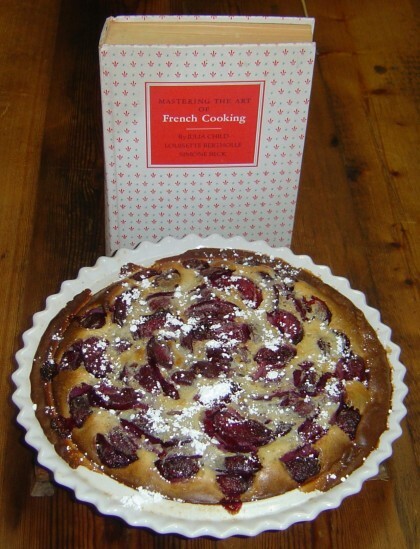 As August is the month when I need as many plum recipes as possible to try to keep up with the huge plum harvest here, the recipe I chose was “Clafouti aux Pruneax” (Plum Flan). It was very nice hot out of the oven, but personally I prefer a more cakelike texture, whereas this recipe’s relatively small amount of flour vs large amount of milk and eggs made for a more custardy, and yes, pancakey, dessert. 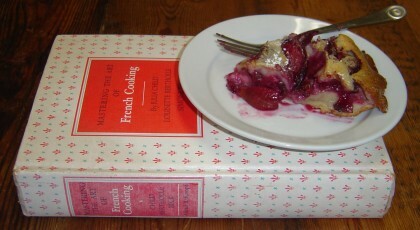 My son Sam recently had a sample cup of scalloped potatoes at Trader Joe’s, and somehow this kept coming up in conversation to the point that I decided to make some for Thanksgiving yesterday — just the sort of thing you could find a really classic recipe for in Mastering the Art of French Cooking! And so here you see my pan of “Gratin Dauphinois” (Scalloped Potatoes with Milk, Cheese, and a Pinch of Garlic), just before I poured boiling milk over it and put it into the oven. I decided to use my springform pan instead of a rectangular glass pan, because it was exactly the size called for in the recipe. Unfortunately, although my springform pan works great with batter, when I poured the boiling milk over the potato mixture, the seal was not tight enough to keep the much thinner liquid from seeping out. 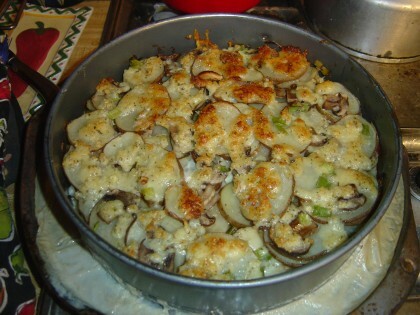 I quickly put a pizza pan underneath, but the milk continued to seep out and boil and develop a skin around the springform pan while the potatoes were cooking. When I posted about this to the Julia Child 101 Facebook group last night, one person passed on the info that when America’s Test Kitchen tested and rated springform pans, they did not find a single brand/model with a truly leakproof seal good enough to keep thin liquids from dripping out (or, if you bake a cheesecake with the pan sitting in a larger “water bath” pan, to keep water from seeping in). 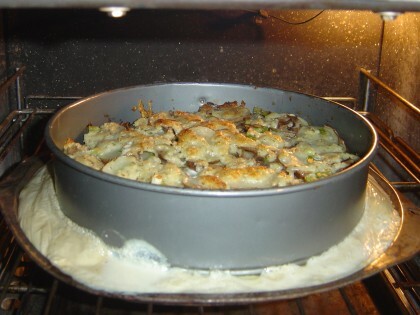 Here you see the Gratin Dauphinois after I took it out of the oven, still sitting on and stuck to the pizza pan of boiled-down milk. If you look the recipe up in Mastering the Art of French Cooking, you’ll notice from this picture that as usual I wasn’t completely following the stock recipe in the first place — in addition to not peeling the potatoes before slicing them I had also added some mushroom slices, diced green onions, and extra garlic and herbs. And I want to note that despite the trouble it did turn out to be a perfectly nice Thanksgiving dish — just more like breakfast potatoes than scalloped (and for that matter the leftovers would have been breakfast potatoes this morning, if they hadn’t gotten eaten as a midnight snack first :-)).